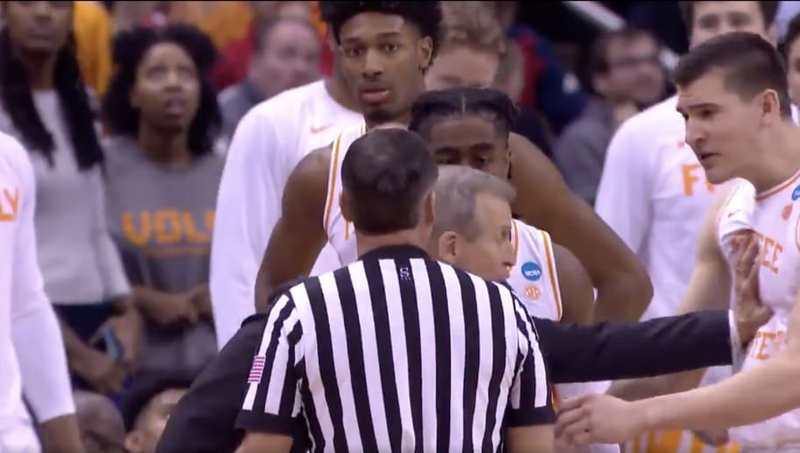 Tempers are already flaring in the 2019 NCAA Tournament, as an outburst from Tennessee Volunteers' head coach Rick Barnes has now taken some of the spotlight away from Michigan State head coach Tom Izzo and his recent altercation with a player. During Sunday's second-round thriller with the No. 10-seed Iowa Hawkeyes, Barnes was arguing with a referee about a questionable call when sophomore forward John Fulkerson stepped in, and the Tennessee coach quickly shoved him out of the way. The Vols built a substantial lead over Iowa in the first half, but the Hawkeyes slowly began chipping away. Watching his team squander a 25-point lead has to be frustrating, and it looks like Barnes let a little bit of that frustration show here. While it initially appeared Barnes shoved Fulkerson out of frustration, it now looks as if he was using the player as a prop to better demonstrate his argument with the referee. Regardless, there are probably better ways of communicating a point than shoving a player. If Tom Izzo is coming under fire for screaming at one of his players, you have to imagine that Barnes will face similar scrutiny. All in all, hopefully this incident won't take too much of the shine off Tennessee's impressive victory.